Jihad Watch : One might almost get the idea that this attack had something to do with Islam, but our moral superiors will no doubt soon be out in force to tell us otherwise. The suspect in the New York City subway blast Monday told investigators he detonated a crude bomb after he spotted a holiday display and did in the name of ISIS to avenge the deaths of Muslims around the world, law enforcement officials said. 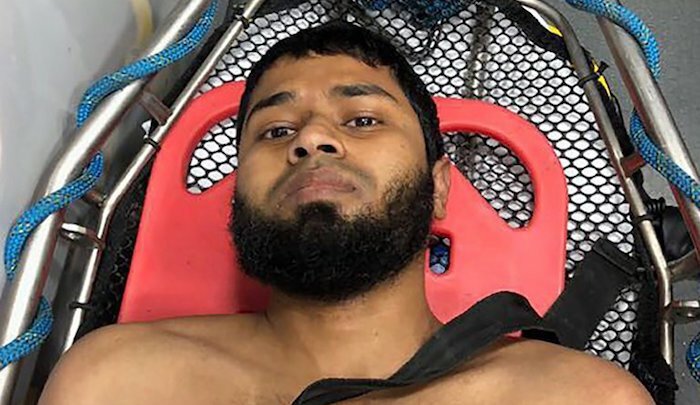 Akayed Ullah, a 27-year-old Bangladeshi immigrant, said he consumed terrorist propaganda and learned how to make the explosive device through online instructions, the officials said. He assembled it at his Brooklyn apartment they said. There is no evidence Ullah, an electrician, had any direct contact with ISIS. But he said his anger over U.S. bombings in ISIS-controlled territory fueled his desire to carry out a suicide bombing, according to the officials. He used Velcro and zip ties to attach the bomb — made from a pipe, a 9-volt battery, matches and Christmas tree lights — to his body, according to police. He found the pipe at a job site and bought the rest of the materials himself, he told investigators. Mindful of ISIS threats timed to Christmas, he decided to set off the device in a crowded subway passageway near the Port Authority terminal because he noticed a holiday image there, the law enforcement officials said. Ullah was taken to Bellevue Hospital with wounds and burns after the Monday morning blast, which was captured on security video and spread panic during the morning commute. Mayor Bill de Blasio said it appeared the suspect acted alone. “All we know of is one individual who, thank God, was unsuccessful in his aims,” de Blasio said. Hasan Alam, a former neighbor of Ullah, said he had not seen him since he moved about a year ago.